A great game that saw 8 goals go in, two teams playing very good hockey and a game that the saying “play to the whistle” wasn’t needed because of the football game playing next to the pitch. First half was a very even game with both us and St Albans playing very good hockey. By the end of the half Winchmore were 2-1 up with nothing separating the two sides. With great goals from Adam Machray from a well struck ball at the 25metres from Mike Dutnall, and a goal for Tim Mall. The second half started with one of the fastest goal from the push back I’ve seen which involved a push back from Tim to Dominic Smith (who was helping the 1’s out for the week and what a player to call on for extra strength in the team) Then an aerial ball went over all the St Albans players and with Tim running onto the ball saw him hit the ball past their goalie. The game would not be the same without our short corner goal machine and most passionate player Jim Gatting with two great goals and continuous great defending. Which helped us go 5-1 making very hard work for St Albans to get a result out of the game. The game finishing 6-2 with goals from Adam, Colin, Tim x2 and Jimbo x2. MOTM – Tim for always finding the goal and playing excellent all the time ? 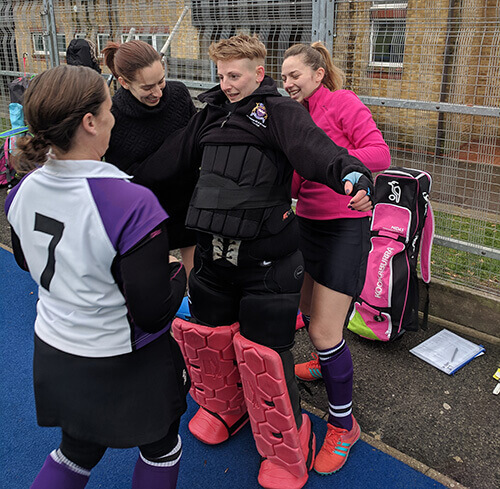 The tenacious Ladies 1s pushed Ashford to the edge today in our 2-1 victory. The opposition were not expecting us to cone out with the pressure we put on them so we watched them get more frustrated as time went on. This only fuelled us as a team and we pushed ourselves, communicated brilliantly and tracked the oppo players for the whole 70 minutes. Our defensive 4 played amazing today, meaning I (yes i was silly enough to go in goal again) didn’t have to do very much at all. Man of the match Sarah E-Q made some amazing stops and was absolutely a force to be reckoned with. Our goals came from a great finish by Rebecca Infanti-Milne and then a finish from Beth Deane from a great ball sent up the pitch by Gemma Gatting. Their goal came from a penalty flick given away by a shin on the line. They aimed for my face so i naturally moved out of the way… Damn reflexes. The match had a tense finish with Ashford pushing and pushing for goal but we simply outplayed them today and wouldn’t let them have it. The ladies 2s had an early start and travelled to Chiswick, Linford Christie stadium arriving to ….portable loos!!! But that was no comparison to the umpiring (which I shall not comment on). After a bit of a rejig in usual positions with Abbi playing in midfield and a debut from Mia, we got off to a great start. Fab play down the wings and brilliant interceptions from everyone. Charlotte made fantastic attacking play dribbling around several players and striking the ball into the goal, not once but twice. WHE 2 up at half time thanks to Freya making a cracking save to keep them at bay. Still, content with a draw, well done ladies we held them off!!! A game we always knew would be a tough one. We had the bare 11 against a well resourced top of the table MBDA. As soon as the game started, we were under pressure, struggling to get it out of our half. Eventually the numbers they were putting into our box led to the first and second goals. We soon started to look a bit more assertive, starting to put the ball in their half having some good through balls into Tej and Asher. Soon though they were back at us, snatching another two goals before half time, leaving us 4-0 down going into the break. After half time we started to push up a bit more. Some good work by Rob, Stan and Joseph down the left wing being particular highlights. Unfortunately, a stick to the rib had left Grant somewhat incapacitated, and that combined with us being a little more aggressive and tired meant we were letting more goals in. Soon though, some good work managed to earn us a short corner. Coming out to Eray, he drilled it into the goal, much deserved. But MBDA were soon coming at us again though, and the goals kept coming. Only some excellent keeping by Balazs kept it down. He’s improving fast, becoming much more assertive in the box. Some wonderful runs by Asher and a good passing game by everyone though were highlights. The final score was 13-1, disappointing but a good learning experience and we’ll come back stronger from it. DOTD: The stick which took out Grant.